Wait What Really OK Podcast 80th Episode and Podcast Content Audit. Wait What Really OK Podcast Episode 80 hosted by Branding Strategist and Keynote Speaker Loren Weisman talks about the podcast hitting 80 episodes with 400 pieces of content and all the bits and pieces that have made it into what it is. A screenshot of sorts of The Wait What Really OK Podcast that includes the podcast itself as well as the photo, video, link and blog supplements. After 80 episodes and a collective 400 pieces ... Más informaciones of content, Loren digs into the structure underneath the hood as well as the rhyme and reason for the cross-marketing that doesn’t leave people cross with the promotion of the show. By supplementing new content to cross-market existing content, it allows for more considerate engagement for those already engaged, while drawing in those that have not engaged or been connected with the content yet. 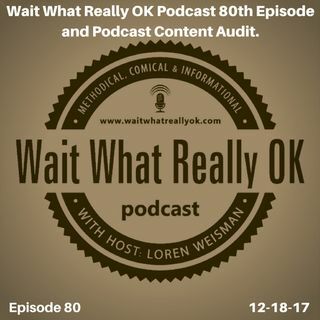 Episode 80 “Wait What Really OK Podcast 80th Episode and Podcast Content Audit.” of the Brand Management and Marketing Podcast Wait What Really OK is available on iHeartRadio. Podcast Blog Supplement for Episode 80 of the Wait What Really OK Podcast with Loren Weisman. Podcast Link Supplement for Episode 80 of the Wait What Really OK Podcast with Loren Weisman. Creating a budget for the time and money put into creating content. Podcast Video Supplement for Episode 80 of the Wait What Really OK Podcast with Loren Weisman. Podcast Photo Supplement for Episode 80 of the Wait What Really OK Podcast with Loren Weisman.